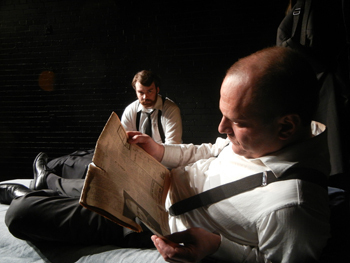 Theatre Passe Muraille’s Backspace is a truly apt location to stage Harold Pinter’s perplexing two-hander The Dumb Waiter. A play that takes place in a basement, the slim black box-esque space lends itself well to the air of suspense that this Two Wolves Theatre production creates rather nicely. Ben and Gus are two men waiting for something, specifically, the details of their next job. We aren’t privy to what that might be, but we know both men are armed with pistols and work under a distinct shroud of mystery so it isn’t too far-fetched to make certain assumptions about their line of work. I’ve only ever seen one other Pinter production before, The Caretaker, performed at Montreal’s Centaur Theatre a few years ago. While not my preferred playwright, I can see why some directors might be drawn to his work. Especially The Dumb Waiter, which, despite its gloomy ambiance, has a level of whimsy that borders on the subtly twisted. With a limited, though apropos musical score by Sebastien Arcos and a sparse set designed by George Quan, the gloom is translated well to the stage. Something sinister is afoot somewhere and it was that uncanny feeling paired with an awkward sense of play that held my interest. That’s the trouble with two-handers though, in my opinion, there’s quite a lot riding on the director to keep the pacing fine-tuned and on the actors to play off each other. Both Carmine Lucarelli (playing Ben) and Jesse Watts (playing Gus) had their moments, but each still seemed to be grappling with other things that made the show drag a little, and for a 50 minute piece (typically staged as a double-bill, according to my play companion), that seems almost counter-intuitive. Lucarelli had a really good tone, and it was fun watching his Ben rev up and wind down, getting frustrated with Gus and then incensed about the situation with the dumb waiter. However, there didn’t seem to be an in-between for the character, he was either mellowed out or high strung, and I think the incline of the action was made less shocking because of it. Watts’ Gus was endearing and a good counter to Lucarelli’s Ben, I really liked the character he’d developed, but felt like Watts was having a bit of trouble with the text. He does most of the talking and a lot of the time it felt like he was reciting his lines as opposed to his character thinking up the words. My good friend Elana who came to see the show with me noted that Watts tended to take sizeable pauses before a lot of his longer speeches, which could have been used more sparingly in order to keep the flow going. Two Wolves does a good job of setting up the mood for the show and Lucarelli and Watts are, for the most part, enjoyable to watch. For a small dash of affordable theatre to break up your week, I say give this one a shot. It won’t blow your mind, but you’ll surely be entertained.